The Guardian can’t resist throwing in a snide attack on “Trump’s America” in the opening of a report on the discovery of a significant new piece of data from the life of Shakespeare, one confirming the poet’s worldly success and resulting rise to gentility. Wolfe’s role as a curator at the Folger is to bring her expertise to bear on the tantalising mass of documents that survives from the late 16th century. And yet, despite a heap of legal, commercial and matrimonial evidence, Shakespeare the man continues to slip through scholars’ fingers. Four centuries after his death, apart from a handful of crabbed signatures, there is not one manuscript, letter or diary we can definitively attribute to the poet, sponsoring the pervasive air of mystery that surrounds his genius. Indeed, the most intimate surviving Shakespeare document remains that notorious will, in which he bequeathed his wife his “second best bed”. Somebody-You-Never-Heard-of College (left) and Benjamin Franklin College (right). The inaugural heads of Yale’s two new residential colleges have been announced by President Peter Salovey and Yale College Dean Jonathan Holloway. Charles Bailyn, professor of astronomy and physics, will be the head of Benjamin Franklin College, and Tina Lu, professor of East Asian languages and literatures, will be the head of Pauli Murray College. Bailyn has been a member of the Yale community since his undergraduate years, earning his B.S. in astronomy and physics from Yale College in 1981 [ Calhoun – JDZ ] and later returning to campus in 1990 to join the faculty ranks. In 2010 he was named the A. Bartlett Giamatti Professor of Astronomy and Physics. From 2011 to 2016 he served as the inaugural dean of the faculty of Yale-NUS College in Singapore. As a Yale undergraduate, Bailyn was awarded the George Beckwith Prize in astronomy and was an avid participant in the a cappella singing scene. Salovey and Halloway noted in their letter that Bailyn considers becoming a pitchpipe of the Duke’s Men at the age of 19 one of the highlights of his undergraduate experience. After completing his Yale College degree, he pursued graduate work at the University of Cambridge and at Harvard University, receiving his Ph.D. from Harvard in 1987 and spending three years as a member of Harvard’s Society of Fellows before returning to Yale as an assistant professor of astronomy. He has served both as chair and as director of undergraduate studies in the Department of Astronomy and was a member of the 2001-03 Committee on Yale College Education, which reviewed Yale’s undergraduate curriculum. He twice chaired the Teaching, Learning, and Advising Committee in Yale College. In his five years at Yale-NUS, he led the recruitment of more than 100 faculty members and supervised the development of the college’s common curriculum. Tina Lu joined Yale’s Department of East Asian Languages and Literatures (EALL) in 2008, with a secondary appointment in the Department of Comparative Literature. She has served as EALL’s director of graduate studies (from 2009-2010), director of undergraduate studies (2012-2013), and chair (2013-present). In 2009 she was a visiting professor with the Yale-PKU program in Beijing; since 2013 she has been a consulting faculty member to Yale-NUS College, where she taught as a visiting professor in spring 2015. Specializing in Chinese literature from 1550 to 1750, Professor Lu has written three books — one on personal identity, one on the nature of the human community, and the most recent (still being completed) about materiality. Noted Salovey and Holloway: “In the course of them, she has discussed a portrait that comes to life, optical illusions, and stories about severed heads!” Her current work examines time travel and its pre-modern antecedents. With colleagues at other universities in art history and social history, she is also at work on a collaborative book about Xu Wei, the 16th-century polymath, playwright, and painter. One of her major ongoing projects is The Ten Thousand Rooms, a web-based platform she is developing with grant support from the Mellon Foundation (and in collaboration with her colleague Mick Hunter) that will allow scholars around the world to work together on the transcription, translation, and commentary of pre-modern Chinese sources. She has been an invited speaker and panelist at dozens of universities and other forums in the United States and internationally. In 2009, she was awarded the Gustav Ranis Prize for Best Book on an International Subject by a Yale Faculty Member, and from 2005 to 2011 she was a Mellon Foundation New Directions Fellow. She has served on numerous Yale advisory groups, from the Humanities Program Executive Committee to the Digital Humanities Executive Committee to the Yale-NUS Advisory Committee and Curriculum Review Committee. Her undergraduate courses include EALL 200, “The Chinese Tradition,” an overview of Chinese culture and history from antiquity to the 20th century. Lu earned her A.B. (in East Asian languages and civilizations) and Ph.D. (in comparative literature) from Harvard University. Prior to coming to Yale, she was a member of the faculty at the University of Pennsylvania from 1998 to 2008, earning tenure in 2004. Yale’s residential college “heads” seem to be younger these days, not as distinguished as they used to be, and more commonly chosen on the basis of “diversity” (what some of us would call: favoritism), but Professor Bailyn looks to me like a decent choice. At least he’s a Yalie. Professor Lu, appropriately for her new college, is diverse. But, at least, she has eccentric areas of academic study, so I suppose they could do worse. What is up, however, with these new college coats of arms? College and universities customarily assume the arms of their namesake. 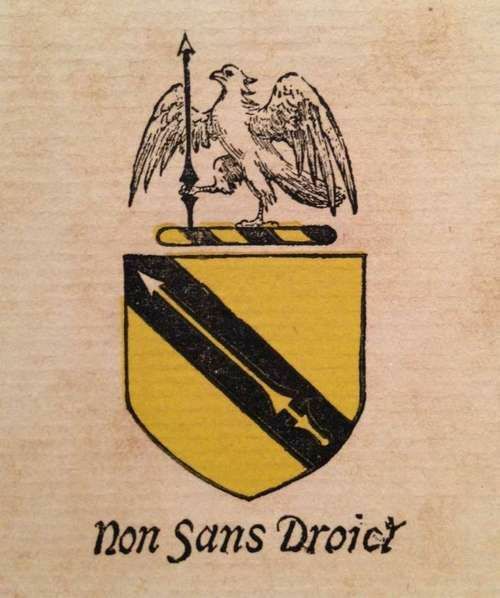 Benjamin Franklin had a real coat of arms, complete with dolphins no less. Why on earth aren’t they using it? 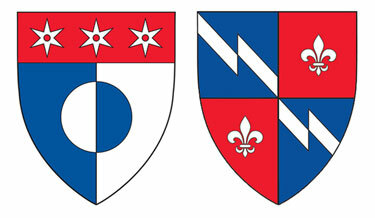 Whatever-her-name-was, doubtless, had no coat of arms, so Yale is free, I suppose, to invent one and confer it on her, but Yale ought to be aware that these are referred to coats of arms or armorial achievements, not “shields.” And unmarried ladies’ arms are displayed on a lozenge (a diamond) or an oval, and not upon a shield. Yale can’t even do heraldry right today. Sigh. 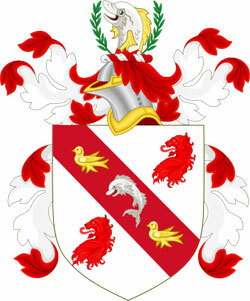 Benjamin Franklin’s real coat of arms, blazoned: Argent on a bend between two lions’ heads erased gules, a dolphin embowed of the first between two martlets or. 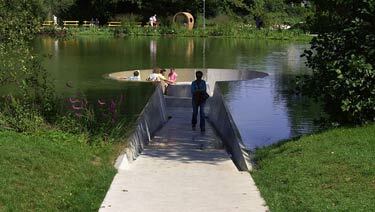 My wife Karen forwarded to me the other day Gizmodo’s story on a dry nook in the middle of a pond in Vöcklabruck, Austria, and it is certainly an eye-catching and amusing architectural gimmick. The interesting coincidence is the location. 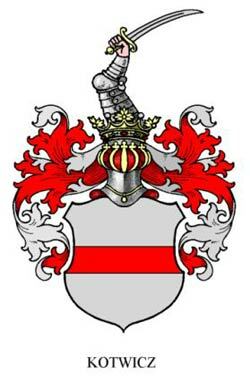 Vöcklabruck, in Upper Austria is my family’s ancestral home. Über die Heimat der Pöchner ist nichts verlässliches bekannt. Während einige dieselben aus Schottland stammen lassen, wieder andere Steiermark als ihre Heimat nennen, kommen selbe zu Anfang des. 12. Jahrhunderts bereits in Salzburg vor, von wo sie sich nach Oberöstereich in die Gegend von Vöcklabruck wandten. Concerning the homeland of the Pöchners there is no reliable information. According to some they originally emigrated from Scotland, but different sources call the Steiermark their homeland. From the beginning of the 12th Century onward they were in Salzburg, from whence they went to Upper Austria to the vicinity of Vöcklabruck. The theory proposed by the former sources is that Buchhaim-Puchhaim-Pöchner surname comes actually from the Scottish Buchan, and that some Comyns related to the Norman Comyns who inherited via a Celtic maternal line the Scottish Earldom of Buchan moved to Austria. This would be a plausible story if the emigration occurred in the years between 1306 and 1314 when the Comyns lost the struggle for power and the throne of Scotland to the Bruces, but the Pöchners are already in Austria two centuries earlier. Below is the Pöchner coat of arms, which the heraldically-knowledgeable will perceive at once represents a simple reversal of the tinctures of the arms of Austria, i.e. of the Babbenburg Dukes of Austria, acquired by Leopold V (“Luitpold der Tugendhafte,” Leopold the Virtuous) in the course of the 1191 Siege of Acre. Leopold’s arms consisted of “Gules, a fess Argent” because in the course of the fighting his tunic had become completely covered with blood except for a white band which had been covered by his belt. Sphragistics, the study of heraldic and other seals, is of considerable interest historically and genealogically. A very impressive collection of seals belonging to Michel Neugarten (can these possibly have belonged to the race car and film stunt driver?) 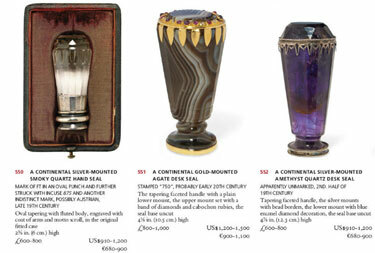 will be sold by Christie’s, Sale 4889, at their South Kensington, London salesrooms on April 25th. 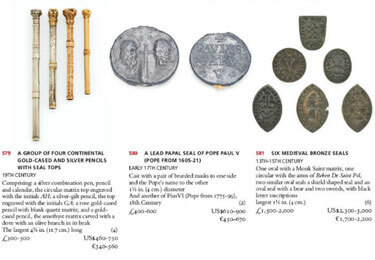 The collection seems to have some very interesting and luxurious 19th century examples, and a number of earlier Western European seals. Ecclesiastical specimens seem to be well represented in the collection. Worst Coat of Arms of All Time? 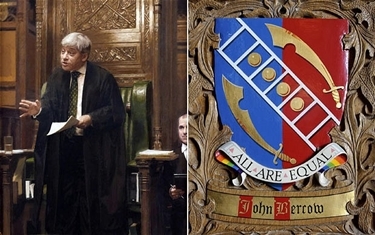 British taxpayers got to pick up the Herald’s College bill of 15,000 pounds for devising John Bercow, the new Speaker of the British House of Commons, brand new coat of arms. I’d say that the heralds and pursuivants must have developed an actual animus toward the new Speaker. They succeeded in persuading him that a ladder (alluding to his rise from humble origins) was a compliment, that four gold balls were alluding to his enthusiasm for lawn tennis (and not his Hebraic ancestry), and that those hideous Islamic scimitars are Saxon seax knives representing the county of Essex (where he went to a red brick university). Right, sure they are! The motto “All Are Equal” between pink triangles with rainbow striping on the back of the scroll really devastatingly tops the whole thing off resulting in the most extraordinarily oxymoronic expression of the triumphant elevation of the spirit of leveling to established status in the hierarchical realm of heraldry. One can just imagine the guffaws emanating from the studio in the Herald’s College. The current coat of arms of the County of Essex, I find, does feature its three seaxes drawn the same as Bercow’s, looking like Middle Eastern scimitars. An earlier, 1611 version of the same arms is much less influenced by the Arabian Nights. I suppose though that I must concede that Bercow’s arms does feature Essex seaxes, in at least the problematic form presumably invented by some ill-informed Victorian heraldist. Now the Nordic Battlegroup, a force of 2,400 soldiers, is looking deeply embarrassed. For sceptics who already consider the Nordic Battlegroup to be something of an oxymoron – it is led by the Swedes, who were last in battle in 1809 – the operation on the lion is not an auspicious omen. “A castrated lion – the perfect symbol for European defence policy,” an American military blogger sneered. There are 18 battle groups in the European Union and the Nordic one, comprising Sweden, Finland, Norway, Estonia and Ireland, goes on standby on January 1, 2008. Most upset, though, was Vladimir Sagerlund, the designer of the crest from the National Archives. “A heraldic lion is a powerful and stately figure with its genitalia intact and I cannot approve an edited image,” he told öteborgs-Posten, a Swedish daily. Hat tip to Englishman’s Castle via Bird dog. 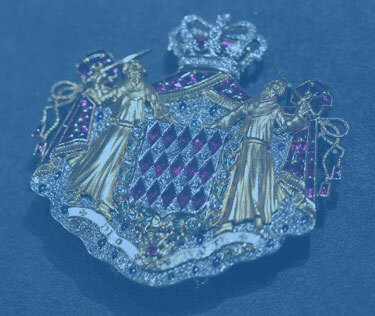 This kind of thing comes up all the time in relation to the arms of particular Swiss cantons featuring bears whose equipment is not only intact, but even more flamboyantly erect and displayed gules, (i.e. red). Attempts to censor the overly-explicit Swiss charges always result in absolute uproar with lots of coarse Swiss comments about refusing to be represented by female bears. 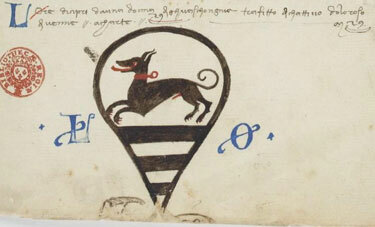 the Archives of Never Yet Melted in the 'Heraldry' Category.